The freshly-signed Sri Lankan-Singapore FTA (SLSFTA) marks a new milestone in the relations between the two island economies. The agreement, signed on 23 January 2018, after almost 18 months of negotiations, is a modern, comprehensive, and high quality agreement. It covers a wide range of areas including goods and services, investment, e-commerce, government procurement, intellectual property rights, telecommunication, etc. While FTAs aim to reduce or eliminate trade barriers and increase trade, more importantly, in the case of SLSFTA, it demonstrates to the rest of the world that Sri Lanka is open for business, including investments, while complementing each other as hubs – Sri Lanka as a hub for South Asia and Singapore for South East Asia. This is in line with Sri Lanka’s Vision 2025, which aims to position the nation as an export-oriented economic hub at the centre of the Indian Ocean. Trade between Singapore and Sri Lanka has steadily grown, with bilateral trade crossing the USD 1 billion mark since 2006.In 2016, Singapore was Sri Lanka’s seventh largest trading partner, with total trade in goods amounting to USD 1.14 billion, accounting for 4 % of Sri Lanka’s total trade. Sri Lanka imported from Singapore goods amounting to USD 1.03 billion, comprising of mostly petroleum, gold, machinery and equipment, chemicals, plastics, iron, malt, and paper. Sri Lanka’s exports to Singapore during the same period totaled USD 115 million, comprising of boats, fuel oil, tea, quartz, gems and jewellery, wheat, crabs, electrical capacitors, nuts, and rubber tyres. Singapore has also been an important foreign investor in Sri Lanka for the past two decades; it has consecutively been among the top 10 investors in recent times. Singapore firms have been active in areas such as property development (Overseas Reality Ceylon Ltd), tourism (Shangri -La Hotels), food and beverage processing (Prima Ceylon, Asia Pacific Breweries), and telecommunications (Lanka Bell). Some of the areas in which investors from Singapore have expressed interest in Sri Lanka include warehousing facilities and logistics, service apartments, furniture manufacturing, training centres, fire safety engineering, solar solutions, and retail. Likewise, Sri Lanka has identified infrastructure, BPO/IT and IT enabled services and educational institutes, tourism, gems and jewellery, and hospital and healthcare as targeted sectors for attracting FDI from Singapore. Custom duties on 50% of tariff lines will be eliminated immediately by Sri Lanka (approximately 3600 tariff lines). This will be gradually increased to 80 % over a period of 12 years. Singapore already grants Sri Lanka tariff free access on 99% of goods. All goods under the agreement have to fulfill general rules of origin of 35% domestic value addition (DVA) and a change of tariff headings (CTH at 4 digit HS level). For some export products, specific process rules will apply. No ASEAN cumulation is allowed under the FTA. Sri Lanka’s Negative List accounts for 20 % of the country’s tariff lines and contains sensitive items based on revenue and domestic considerations (i.e., petroleum products, alcohol and tobacco).Under the agreement, international standards and practices have been adopted to reduce non-tariff measures impeding trade. Better access to service sector markets in Singapore and Sri Lanka, with liberalization across different modes of trade in services, in sectors such as professional and trade related services, environmental services, construction, and tourism. Movement of natural persons will be linked to commercial presence (e.g., intra-corporate transferees). Only Singaporean and Sri Lankan nationals are recognized under the Agreement. The FTA includes a chapter on investment which provides a binding commitment and framework guaranteeing predictability and transparency for investors. Government procurement (GP) is included in the agreement, ensuring Sri Lankan businesses can compete with Singapore businesses for government contracts. This is the first time Sri Lanka has included GP in its trade agreements. Reduced business costs and red tape around customs processing, and technical and quarantine standards. A clear process to settle disputes. There are two compelling arguments supporting the agreement; at the bilateral level, it provides reciprocal benefits for both countries. It will enhance bilateral trade, improve the economic and investment relationship, and provide more secure and open access for goods, services, and investments in Sri Lanka and Singapore. But more importantly, it will help Sri Lanka advance the government’s policy of trade liberalisation, and signal its commitment to economic reforms, by signing a deal with one of the most liberal economies in the world. The FTA is also expected to encourage greater investment flows between the two countries. 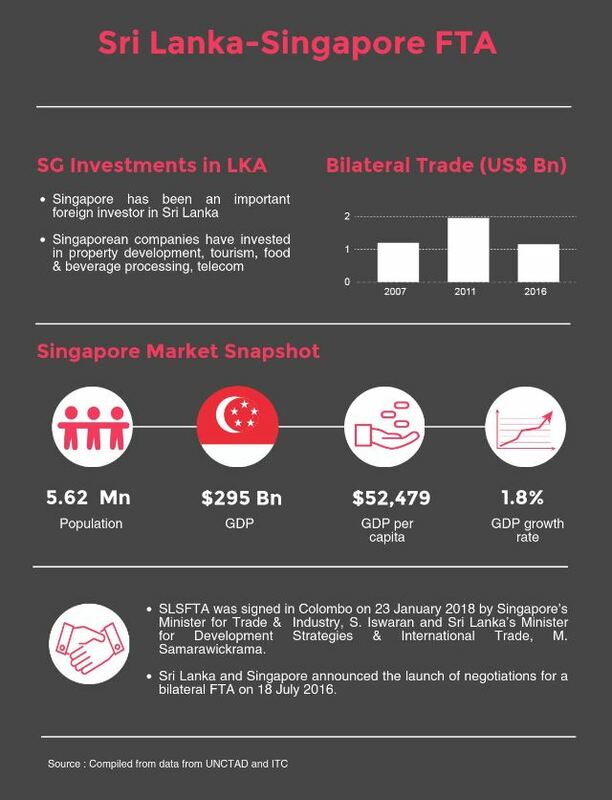 Singapore sees potential in Sri Lanka as a destination for Singaporean investments and a gateway to rest of South Asia, given the proximity to and trade agreements with countries in the South Asian region. At the regional level, the agreement serves Sri Lanka’s broader engagement with one of the fastest growing regions in the world – ASEAN. Stronger relations with Singapore can help Sri Lanka’s standing in South-East Asia and participation in global value chains. SLSFTA is Sri Lanka’s first FTA with a South East Asian country – Sri Lanka has expressed an interest in pursuing trade deals with Malaysia, Thailand, and Indonesia in the near future with a view to improving economic linkages with ASEAN and joining the mega trade agreement, Regional Comprehensive Economic Partnership (RCEP). Sri Lanka’s overdependence on European and American export markets increases the economy’s vulnerability to external shocks, such as the economic recession in 2008 and the loss of GSP+ concessions in 2010. Diversification of both export markets and the basket of exports are thus vital to position the Sri Lankan economy on a more sustainable footing. Therefore, the SLSFTA could act as a catalyst towards more proactive engagement with fast growing economies in East Asia, through exports and investments. The success of such an agreement, however, would also depend on sustained political will along with domestic institutional and economic policy reforms to facilitate better export sector growth and investment. For instance, Sri Lanka’s complex para-tariff structures and the existence of other non-tariff barriers could severely undermine the success of the SLSFTA. Economic liberalisation efforts often create pockets of sub-industries that lose out. Therefore, the government should also create adequate safeguards through trade adjustment assistance schemes and ensure that the broader economy does not lose out on potential benefits due to resistance by special interests. 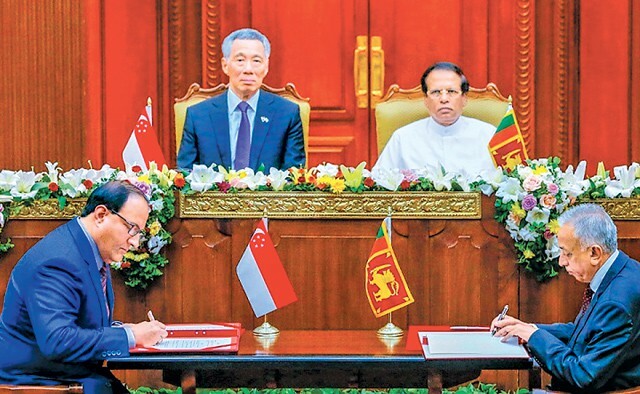 In fact, Sri Lanka could learn from Singapore’s previous experiences in complementing a network of strategically placed FTAs with domestic economic reforms. Therefore, the SLSFTA should be considered, not just in isolation, but as part of a broader strategy to create an economy led by private sector growth and well integrated into regional and global value chains. Authors, Janaka Wijayasiri is a Research Fellow and Kithmina Hewage is a Research Officer at IPS. The Beginning of the End of Cheap Labour for Sri Lanka’s Manufacturing Rivals?